What pleasures Victorians took in their “flirtations!” Even though there were behavioral rules in place–and many of them strict rules–one that was permitted at social events was flirting. 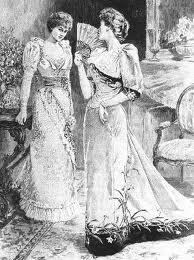 Now, the Victorian women didn’t want to be too obvious about their flirting, so they started using flirting “props” such as their parasols, gloves, and fans to send a message of interest…or disinterest. Since ladies carried fans wherever they went, use of the fan as a communication tool became very popular in the 18th century and carried over into Victorian times. Since it’s summer in the South, Meredith Sweetpea often carries a fan of her own and has been known to use it to flirt! Here are some of the popular fan signals and what they mean. Maybe you can practice at home.